On Wednesday night Ozawa Hall hosted the Emerson String Quartet’s program of Haydn, Britten, and Beethoven, which also introduced the ensemble’s new cellist. 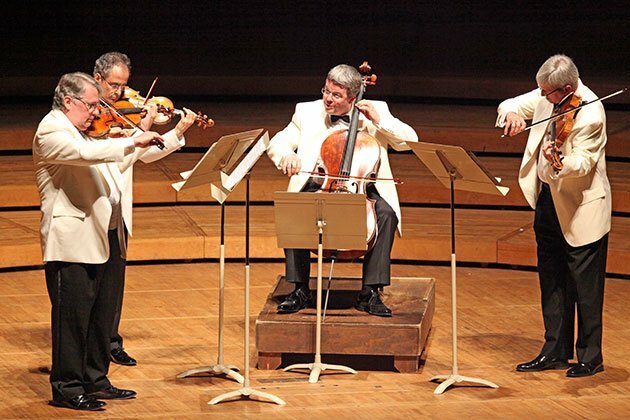 The foursome explored the evolving conventions of the string quartet in three masterworks, here played masterfully. Formed in 1976 and based in New York City, the quartet takes its name from the Concord Transcendentalist. From 1979 until May, 2013, the same four musicians comprised the ensemble. Over that 34-year-span of active concertizing and recording, the Emerson gave consistently polished performances marked by an uncannily tight level of ensemble playing. With the retirement of David Finckel, the quartet welcomed Paul Watkins, its cellist since May 2013—a player perhaps better known in his native Britain, for his work as soloist, conductor, and chamber musician. So a question foremost in the minds of many: how has the group changed? I am pleased to say that the Emerson remains one of the more exciting quartets. Although Watkins has only been in the ensemble for the past three months, these performances with him were polished, highly structured, and tightly glued together. He joined Eugene Drucker and Philip Setzer, violins, and Lawrence Dutton, viola, and all played with a great ease amongst themselves and a degree of familiarity that belies the ensemble’s new line-up. As for Watkins, I found him accomplished and sensitive. There is a difference of tone and musical personality between him and Finckel, of course, and this does change the timbre of the ensemble. Watkins I found to be cabernet sauvignon to Finckel’s Bordeaux. (Your tastes may vary.) I am thankful that this program gave ample opportunity to hear Watkins in his new role. It opened with Haydn’s String Quartet No. 26 in G Minor, Op. 20, No. 3 (1772). The opening Allegro con spirito was marked by a sense of delicacy joined with the metrical forcefulness of a dance, and played here across a wide dynamic range. The second movement Minuetto began in a melancholy vein, then flowing arpeggios in the first violin kicked off the secondary Alegretto; I found the end of this movement curiously inconclusive, and am uncertain whether this is something about their reading of it or of the composition itself. The third movement, Poco Adagio, foreshadowed a Romantic lullaby; Watkins admirably acquitted the exposed legato line in the cello here. The concluding Finale. Allegro molto was frisky yet restrained in this reading: a footrace among courtiers. From 18th-century courtoisie we jumped forward to Benjamin Britten’s String Quartet No. 3 (1975). Composed late in his life, this five-movement work was premiered posthumously by the Amadeus Quartet, to whom it is dedicated. The opening Duets: With moderate movement resembles two tangentially-related conversations with changing partners transpiring around a dinner table. The second movement, Ostinato: Very fast plays with the idea of repetition creating memory. At times the ear supplied the unplayed figure that serves as the generative musical cell for this movement. Solo: Very calm is a subdued interior movement, with sustained lines. Burlesque: Fast — con fuoco was fiery, but also serious. The concluding Recitative and Passacaglia (La serenissima) built in volume and intensity, acquiring a profundity through repetition until the movement’s and the work’s end. This is music which explores the value of silence, and in this reading, that which was heard and that which was un-heard were both given their due weights. Following intermission, we heard Beethoven’s String Quartet No. 7 in F Major, Op. 59, No. 1, “Razumovsky” (1806). In its reading of this well-known work, the Emerson brought out the lyricism and the bouncing lilt. Performed with great rhythmic integrity, excitement nevertheless suffused the music. We heard the innovative ways Beethoven used the given structures of the genre to express ideas which sought to transcend the inherited tradition of quartet writing. The concert concluded with an encore: “more Beethoven,” as Dutton characterized it from the stage. We were treated to the fleet fugato finale of the third Razumovsky Quartet (Op. 59, No. 3). While not taken at such a flying tempo as on its recording, the Emerson String Quartet still impressed. The ensemble remains atop its game. I do not quite understand the reference to Mr Watkins being cabernet and Mr Finckel bordeaux.Cabernet is the foremost grape with merlot to produce Bordeaux red wines.Where does this leave Mr Finckel? Could his playing be just a generic Bordeaux? I could not disagree more.Please,explain more clearly.Great review!!! Just guessin’ here about a cryptic and, for me too, unhelpful analogy. But any change to the Emersons that dials back their typical hot, tense and biting sound and approach will be most welcome, winelike or not. New World vs Old, perhaps. An interesting observation, given the existing Emersonians’ preference for modern instruments and (I’ve been told) even carbon fiber bows.